Tactile Tools are part of a facilitated workshop experience. 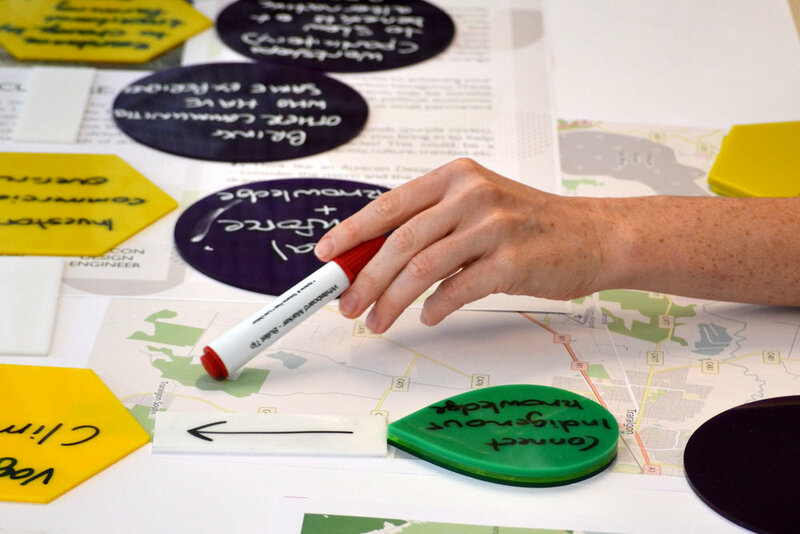 The tools are custom-designed acrylic tiles on which participants collaboratively define goals, roadblocks, work-arounds and moments of insight. Teams build their way towards a goal, collaboratively problem solving their way around institutional, structural or social roadblocks that emerge. Leah designs the interaction and creates resources to scaffold the activity - these may include stakeholder profiles, spatial mappings, personas, community empathy maps. The approach enables participants to problem solve in a collaoirative and embodied way. For each workshop Leah designs a custom-designed 'vision' tool that embodies meaning for your organisation. Whether this be delivering care with love, kindness and understanding; becoming a human-centred engineer; or delivering a respectful death this custom tool enables transformation to occur within each person. It is the reminder for the individual to empathise with the person at the end of the design process. The tools are just that - without the design thinking expert to guide the activity the approach falls flat, another gimmick. With Leah's 10 years of facilitation and collaborative design practice design road-mapping becomes an opportunity to shift thinking, in a big way, for the long-term. Design road-mapping has been developed by Leah Heiss through her 10 year design practice and PhD research into interdisciplinary design collaboration. It draws on the latest evidence-driven research in collaborative decision making, co-design and service design approaches. This knowledge is embedded in a facilitated approach that can be used in any industry to promote change and innovation, bring people together and inspire transformation. The method has been successfully employed in cancer care, engineering and aged care contexts. - Assistants to aid in setting up running workshop and documenting teams during the activity. - 12 retouched image files to be provided to your organisation after the workshop. * These assets will remain your property after the workshop to remind participants of the experience and reinforce behaviour change into the future. Contact Leah Heiss here for a discussion and to book your workshop. May 2017: The design road-mapping approach enabled Aurecon engineers to embody the principals of the Aurecon Design Engineer (Creativity, Empathy, collaboration, Transdisciplinarity, Collaboration, Design Thinking and Communication) while working on a human-centred engineering problem. 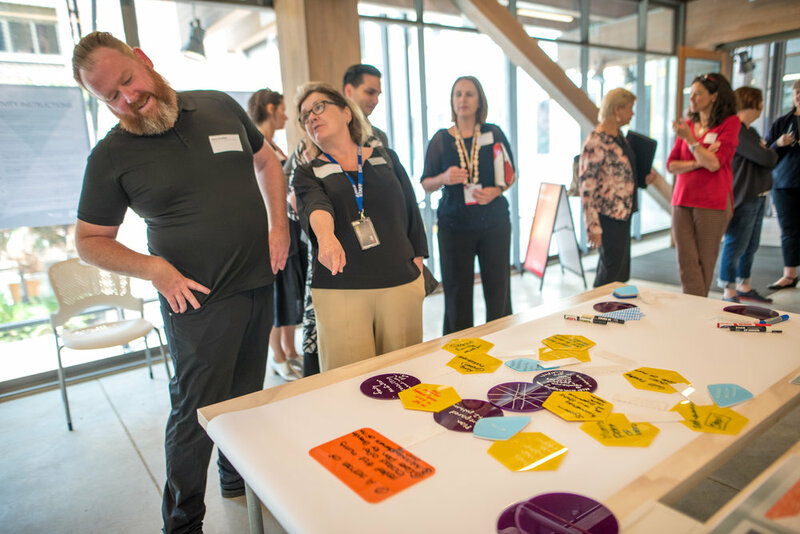 February 2018: The One Good Death workshop brought together 47 experts from across health, government and education to redesign end-of-life experience. Working with the Tactile Tools participants were able to problem solve while empathising with the lived experience of the person at heart. Co-facilitated with Dr Marius Foley and Matiu Bush from Bolton Clarke; part of the RMIT ECP Engaging for Impact Conference. We used the Tactile Tools with a group of 45 people from across health, education, government and aged care to road-map our way to a 'good death' for all people nearing end-of-life. Workshop co-facilitated with Matiu Bush from Bolton Clarke, Dr Marius Foley from RMIT University. Part of the RMIT Engaging for Impact event.